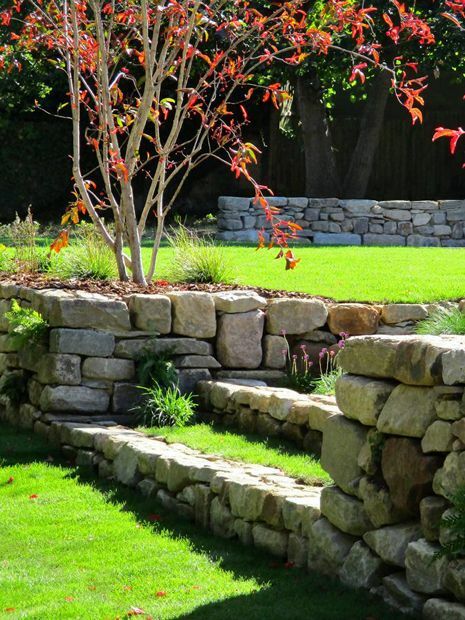 While level changes are at times tricky to reshape, a cohesive garden design transforms challenging topographies by producing an essential ergonomic continuum. 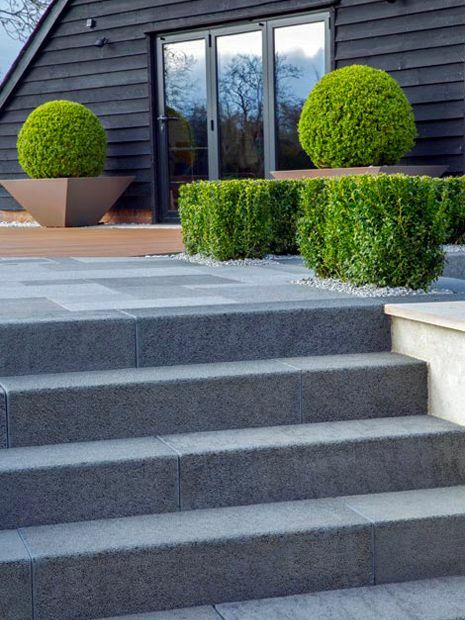 Steps can be discreet, enabling gentle passage from one spot to another, as the eye engages in foliage and textures, or dramatic, announcing themselves as a key architectural focal point. 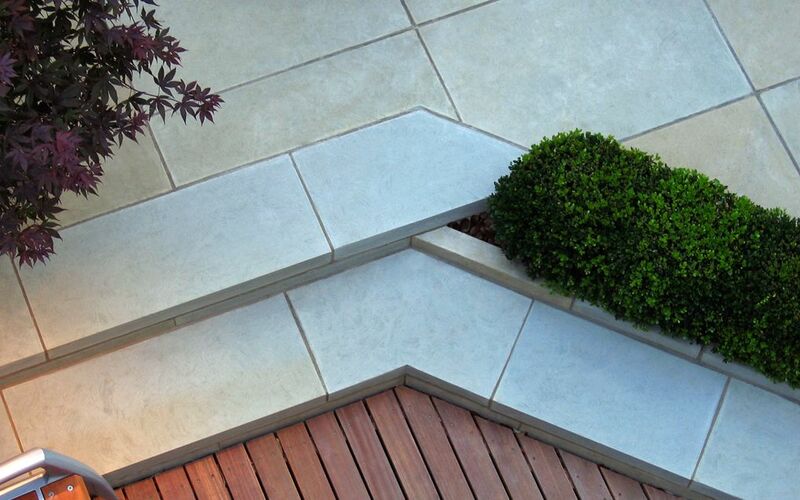 When designing modern bespoke garden frameworks, we often prefer asymmetrical step outlines, forming dynamic layouts which enhance movement and spatial depth, while mitigating design predictability. 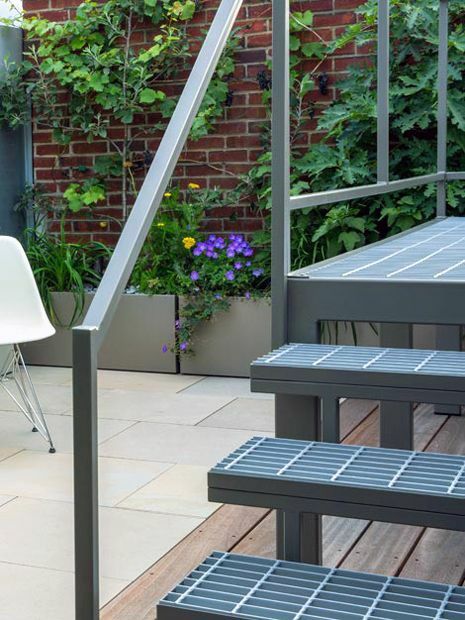 We detail step risers and treads ergonomically to provide the safest, most comfortable transition – where level changes, traversed by elegant garden steps, form the crux of an embracive outdoors. 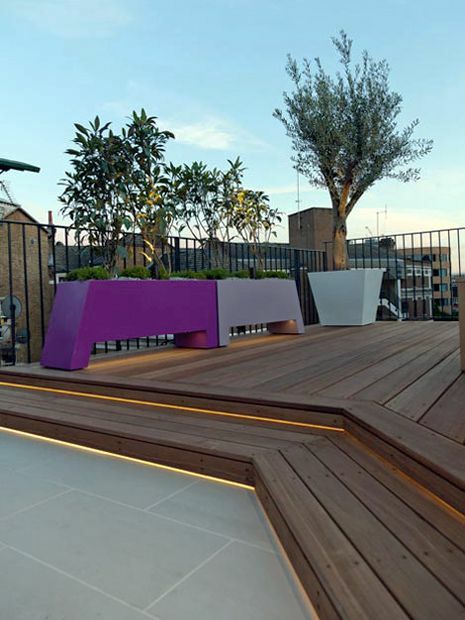 The European Oak deck boards in this Tempus Wharf roof terrace were milled to match the interior floor, enhancing integral fluidity. This silky hardwood material was continued within the step riser, where an LED strip light fits between the sandstone tread and the wood. The angled layout creates effortless transition, producing an expansive panorama towards Canary Wharf. At 14cm height, this level change floats above an 8mm shadow gap in a lightweight outline. In this conserved wharf near Tower Bridge, we developed a large roof garden, where lightweight decking, porcelain tiles and synthetic grass form optimal surfaces, enhanced by innovative rooftop lighting. With a new skylight fitted at the top level, a further step was required to offset a height increase. Utilising 6” Balau hardwood along the upper deck and across the step treads distinguishes transition, augmented by an angular layout. 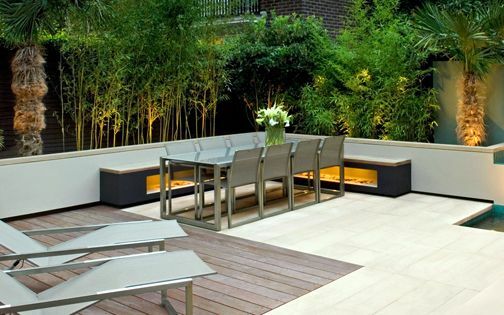 The warmth of wood forms an ideal surface for high social use, while contrasting the light tiles and vivid artificial grass. The riser gaps were detailed with LED lights, producing subtle directional glow, and connecting various zones ergonomically. This Clerkenwell penthouse apartment features three roof terraces above a dynamic streetscape setting, nestled within a dense urban skyline. While the rooftop outside the living room is situated along a main road, the upper terrace forms a thriving wildlife garden among the shelter of brick walls. Yet, the view is inherently obscured by the building's layout, where we designed and built a 1-metre-high steel staircase, enabling access to immerse in scenic city vistas of St Paul's Cathedral and Old Bailey. Fabricated in hot-dip galvanised steel, the efficiently ergonomic steps infuse an industrial ambience, in keeping with local architectural elements. This unique structure evolved from a concept developed for a nearby Barbican roof terrace at the top of Cromwell Tower, where we designed a solution for a similar hidden city panorama abundant in significant London landmarks. The unusual level changes in this Covent Garden rooftop entailed a fluid layout of steps to integrate various outdoor zones. The central deck, featuring a sizeable cooking hub, is connected via two sets of steps surfaced in Balau hardwood. LED lighting strips accentuate the shadow gap below the risers, increasing visibility at night-time, while articulating an urban nuance evocative of a Central London location. The effortless framework highlights Mediterranean rooftop foliage essence, underscoring iconic landmarks across the skyline. 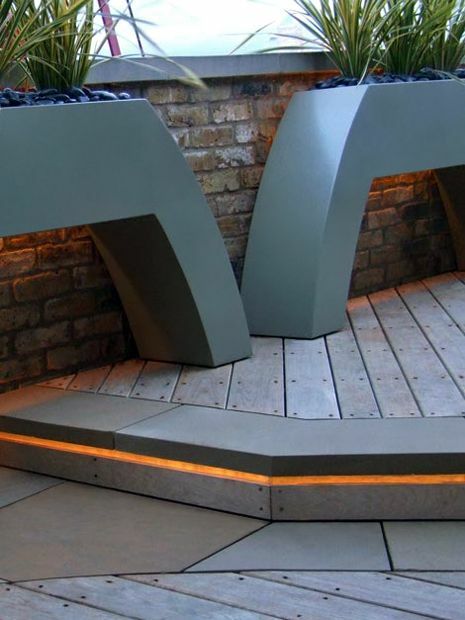 When we first designed a hardwood fascia with a stone tread in a Wandsworth garden, this refined detail produced a subtle continuum, and we continue to develop this method utilising various materials and lighting techniques. This composition infuses Japanese nuances, inspired by the natural elements prevalent in Eastern gardens within edge details and paths. While the step is 15cm high with floating gaps of 10mm between the risers, the structure appears lightweight and elegant. In this large Chiswick garden, hardwood and red sandstone define the stairs leading to an expansive swimming pool. 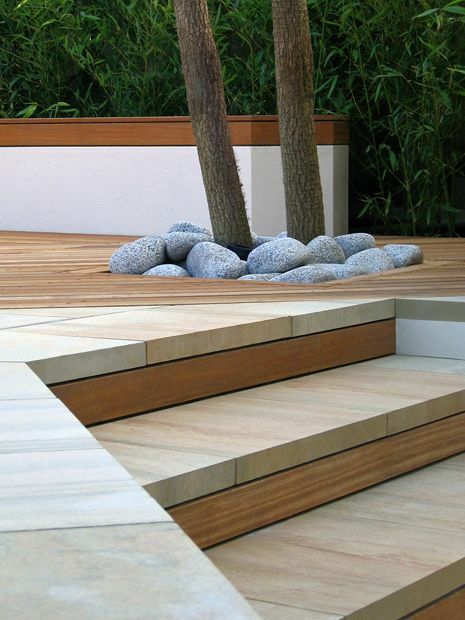 While modernising this unique woodland roof garden in North London, the upper landing's wall provided a solid backdrop to semi-cantilever a spacious flight of stairs. A steel frame was designed to support the stone, powder coated and fixed to both wall and floor. 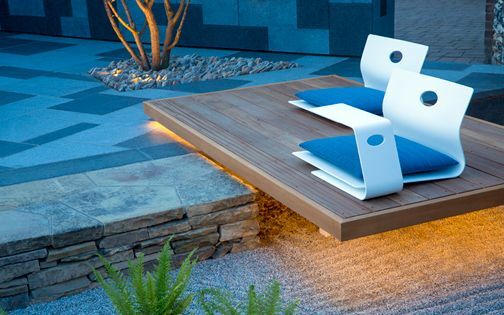 Four sections of 1.5-metre-long sandstone pavers were cladded onto the frame to produce warm open treads, lit below with LED strips. 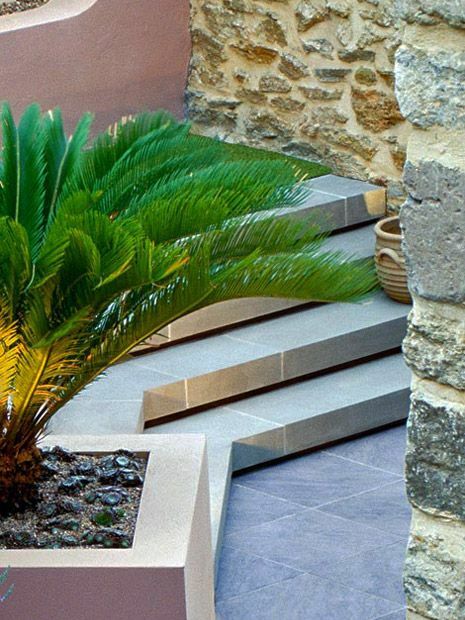 This sculptural Dorset courtyard was formed entirely with natural stone, where a 20-step stairway leads into a landing from the upper parking space, adjoined by a further flight of stairs which ultimately unveils a secluded, intimate courtyard garden. The unique sequence galvanised minimalist detailing, where bespoke angular step sections were quarried in full-height pieces which revitalise the atypic setting. 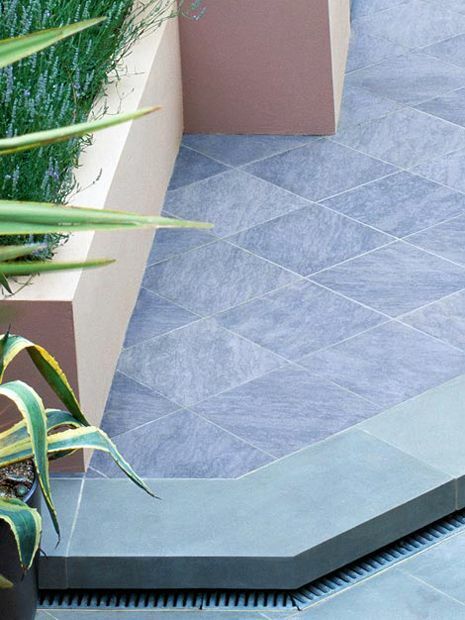 Specifying the stone at 110mm height created a distinct architectural element, and provided a pristine backdrop to accentuate the textures of tropical garden flora. 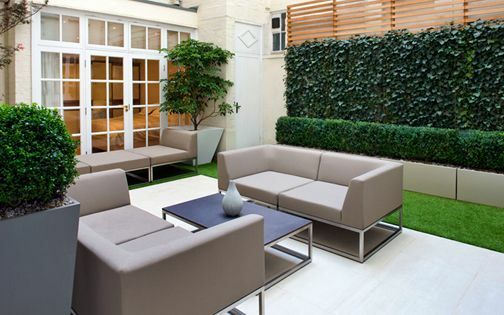 Floating above recessed plinths, the smooth grey sandstone merges with the courtyard's 300-year-old textural walls; its neutral hues contrasted by the paving's brown surface. 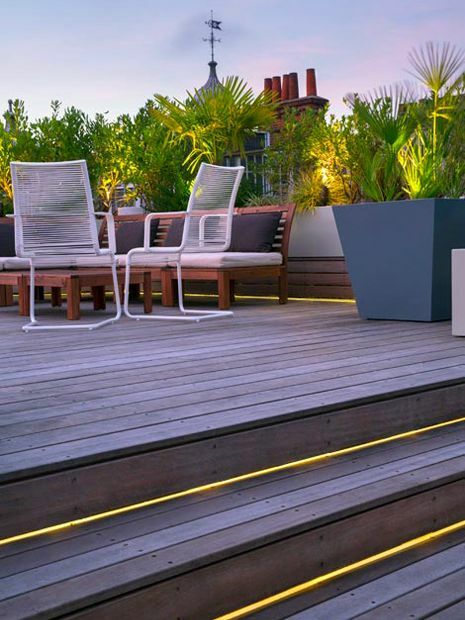 The upper section of this Central London roof garden is defined by a set of grand, 10-metre-long hardwood steps. Two raised beds flank the stairs, featuring sculptural Agave succulents, while repeating the main Iroko deck's detailing in their curved coping and architectural design. 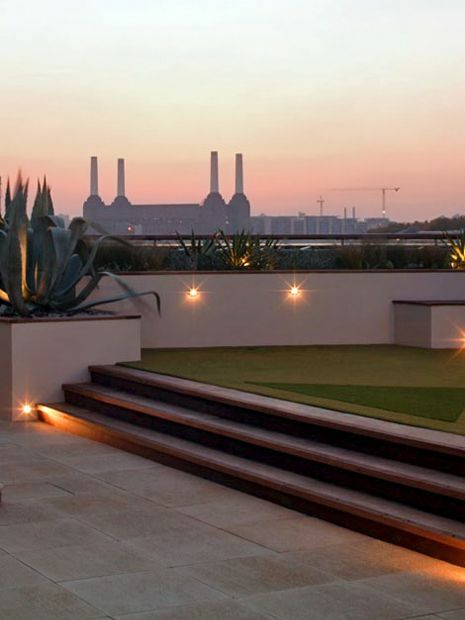 Light beams across the risers emit a warm glow, highlighting remarkable Battersea sunsets. Buff concrete pavers progress towards a synthetic grass podium enjoyed as a mini putting green, set afloat Vauxhall Bridge at St George Wharf's apex in sheer outdoor luxury. A robust flight of steps forms a fluid continuum in this expansive Saffron Walden landscape, linking a sunken Japanese garden into the poolside patio area. 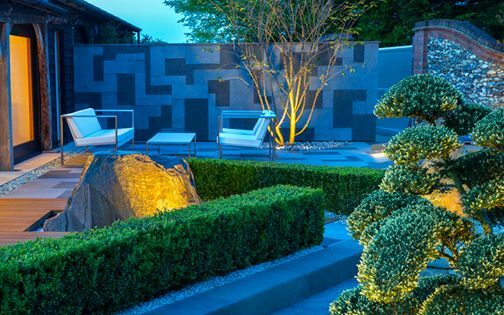 By specifying solid basalt segments with a slight bullnose, the layout is softened. We utilised a hydraulic slab lifter to position the heavy step elements, hired locally during this long-term landscape design & build project. The textured step treads provide ample grip, forming a cohesive outline with the myriad of granite, quartz and sandstones detailed throughout the scheme. The blue-grey sandstone in this Kensington garden matches the kitchen tiles at 400 x 400mm; its surface delicately accentuated by natural light, amid graceful woodland ambience. While the paving's flagstones were quarried at 50mm in cross section, we also specified 110mm-high segments for the step's front edging. 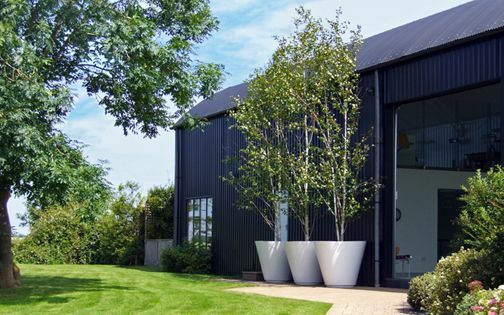 The level change is highlighted by a floating tread above a 40mm recessed riser, where a continuous, minimalist step detail was constructed along the garden's entire width – increasing depth and merging with textural perimeter walls. 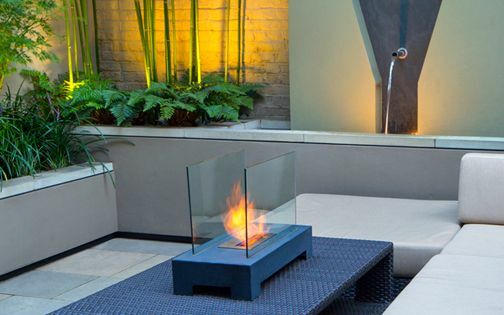 The light blue stone is contrasted by slanting terracotta pots and a concrete water feature cube gilded in gold leaf, enabling effortless movement within a split-level garden space. 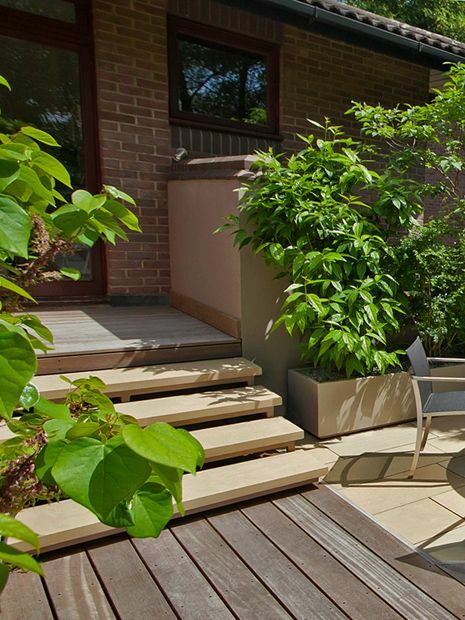 It's vital to bear the user in mind when detailing garden steps: how invigorating is the passage through the outdoor space; what are the sight lines, scents and textures along its varied transitions; and how comfortable and safe is the entire journey? 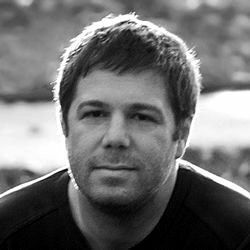 While designing steps to mitigate level changes forms a necessity, in flat back gardens and roof terrace schemes this pivotal design technique generates new topographies. 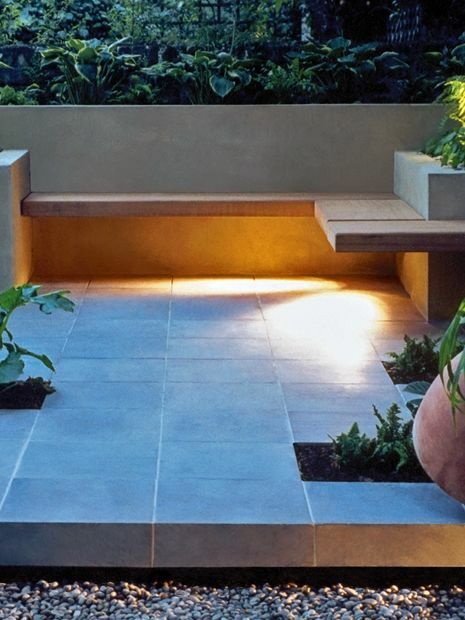 Whether subtle or grand, staccato or legato, garden steps enhance focus, scale and three-dimensionality by defining outlines, shadows and lighting, while sustaining integral planting.